The Independent Cambridge Student Newspaper since 1947. Whether it’s for brand recognition, graduate recruitment or retail promotion, Varsity offers a wide range of advertising solutions to meet your needs. Varsity is the only award-winning student newspaper in Cambridge. Established in 1947, we are one of only three fully independent student newspapers in the UK. 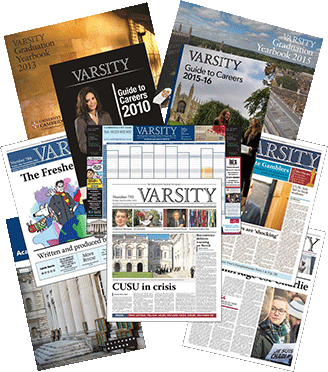 Unlike other student newspapers affiliated to student unions or University authorities, Varsity retains full editorial and financial independence, making it the most established and trusted news source for anyone with an interest in the University of Cambridge. Varsity prints 19 issues a year, as well as continually publishing online at Varsity.co.uk. Our papers are professionally delivered directly to colleges, teaching faculties, key Cambridge University locations and across the rest of Cambridge early on a Friday morning (Including Anglia Ruskin University and Addenbrooke’s Hospital. With an estimated print readership of 23,000, we print 10,000 copies per edition, although our edition on 30th September (our Freshers Special) has an even higher print run of 12,000 copies. Thanks to our huge alumni readership, reach into the wider community and those with an interest in Cambridge itself, higher education and of course the global brand that is Cambridge University - the PDF and browser versions of the newspaper online means a further additional 20,000 downloads of each electronic edition of the newspaper. We have an un-paralleled reach that extends to all 31 University colleges plus Cambridge University faculties and departments as well as selected retail outlets and social spaces throughout the city - our newspaper has over 160 separate distribution points in total. Varsity.co.uk has been providing up-to-the-minute breaking news and commentary for the past twenty or so years, making us one of the first student newspapers to have an online presence. Our website boasts an average of 30,000 unique visitors each week, with over 50% of visitors logging on from University locations. We don’t just produce a newspaper in print and online! We can also offer leaflet distribution, produce an annual careers guide, print a Cambridge academic year planner and each year we publish the official Cambridge University Graduation Handbook in association with the University of Cambridge Alumni Relations Office. We also publish The Mays — a yearly book of poetry, prose and illustrations featuring the best of new writing from the students of both Cambridge and Oxford University. Click the links on the right to find out more information and to see our prices. Download our complete Media Pack for 2019-2020.